Why cite the most popular content? 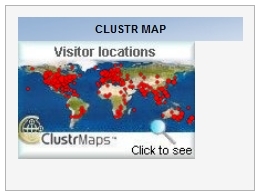 Like many bloggers, I have a map on site showing where visitors are coming from. Why? World viewI think there are two aspects to this question: why have a map, and why show it to the world? On the first issue, it is quite nice to look at one's reach. I have to admit to a little thrill when I see that someone in Borneo, say, has been checking out my blog. And I find it fascinating that I can write something now, sitting here in my home near London, England, and seconds later someone on the other side of the world, in Australia or New Zealand, can be reading it. I am still intrigued despite having done this kind of stuff for nearly 15 years. But the other question, about why show it, is more problematic. At first, I did so because I wanted people to see that I am being read internationally. I now feel that one should be able to take it as read that that's the case, and not make a big deal out of it. I also think, like recent comments, it's a matter of context. When I took part in the Classroom 2.0 Live discussion, people were asked right at the start to click on a map to show where they were listening from. Seeing the whole world 'light up' as members of the audience did so was an incredible experience. And for me, as the guest speaker, it really did bring it home to me that, although I was loafing around in casual clothes and unshaven, I was addressing a global audience in just as real a way as if I had been speaking at a physical event. So, given that there's not much point in displaying a map on my site, because it lacks context and smacks ever-so-slightly of egotism, why do I continue to do so? The answer, I'm afraid, will be familiar to married men everywhere. My wife likes to look at it, and doesn't want to have to bother logging in in order to do so. International ICT in education superstar I may be, but at home I know my place! Many blogs display recent comments, either by the blog owner or other people. I've implemented this myself in the past, but now have reservations about doing so, for the following reasons. Firstly, I'm not a legal expert but I should have thought that if you're going to display people's comments somewhere other than where they originally posted them, you should at least warn people that you may do so. A lot of blogs don't. Suppose I read on someone's blog that she wrote an article for a commercial magazine, for no pay in order to get her foot in the door, and has now been told that they are not interested in commissioning her for any paid work. However, because her article was pretty good they would always be interested in receiving more, just not in paying for them. I might write a comment like, "Your first mistake was writing an article for free. You should always agree on the fee before putting pen to paper, as it were." Taken out of context, that could be quite reputation-damaging. It suggests, for example, that I would only write an article if I am going to be paid money for it. Anyone reading the comment will not have the benefit of seeing the context in which it was made. In this respect, automatically posting recent comments suffers from a similar consideration to posting Twitter conversations, ie they only make complete sense in context. As for posting your own comments automatically, I don't see the point in that at all, unless it's to demonstrate to all and sundry how ubiquitous you and your wisdom are. But again, taken out of context, your own comments have little meaning in my opinion. What I think would be quite handy would be an application that collates comments from all over the place on a particular blog post. I sometimes have few comments on the blog itself, but they appear elsewhere such as on Twitter of Facebook. I think overall, my objection to automatic comment posting from an educational point of view is that it represents a poor use of ICT in education. To my mind, ICT should seek to solve a problem or answer a question, not be used just for its own sake. Perhaps if someone could explain the point of displaying comments somewhere other than where they were put in the first place I'd feel differently about it. We're always hearing about new widgets. I love experimenting with widgets, but I think it's easy to get carried away with the wizardry of widgets. Some of them are, in my opinion, a waste of time, and I thought I'd share my views on some of these. One thing I see a lot of is the Most Popular Articles widget. The idea is that people can see at a glance which articles on your website or blog have been most clicked on. I've messed around with this myself, and when I started this new website just over a month ago, I was a little disappointed that Squarespace provides no obvious way of displaying this information to the public. "But", said my wife. "Isn't that sort of widget just a self-fulfilling prophecy?" She was right. The existence of such a widget is designed to encourage people to click on your most popular articles, thereby making them even more popular. I suppose it's based on the idea that all these people can't be wrong. But what if the current zeitgeist changes? If your most popular articles all seem to be about X and the new Zeitgeist is Y, doesn't that immediately put people off, especially first time visitors to your blog? In any case, far better, in a way, would be to encourage people to read your least popular articles. A more useful variation of this sort of widget is one which provides links to related articles, which is why I like using Zemanta. That is not to say that knowing which articles are the most popular isn't useful. I use the information to try and guide my writing, to some extent. I think if you want to draw people's attention to other articles on your site, the best approaches are to list the most recent articles (which is the one I've adopted, and has also been adopted by Windowsbytes, where it works really well, I think), or to show which other posts are related to the current one being looked at, as seen at Problogger (although Darren Rowse, who owns it, also includes a popular articles section). When I come across sites that do one or both of these I tend to get drawn in, which is what the blog owner wants to happen. If we transfer these ideas to an educational context, it seems to me that a widget in a virtual learning environment which automatically (or semi-automatically) showed related articles or links would be very useful indeed. It would certainly be more useful, and probably less fraught with potential problems, than one which showed the most popular articles or links.